A catch and release aquarium? Ever feel conflicted about watching animals in captivity? Zoos and aquariums do important research, species reintroduction, and education, but when the last frontier for wild animals is a confined space I feel sad. However Ucluelet aquarium on British Columbia’s Vancouver Island has a new spin on animal attractions. Each spring, volunteers go into the cool Pacific waters and gather specimens for the aquarium and at the end of November those same creatures are released back to where they came! 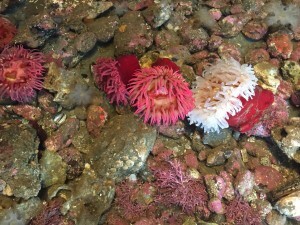 Some creatures – like sea anemones – that attach to rocks stay year-round (ripping them off would be very harmful) but anything that is free swimming goes home to the ocean at the end of the tourist season. Visitors can enjoy the colorful flash of a rockfish but its stay at the aquarium will be just a short part of its decades-long lifespan. Janusson explained, “octopuses double in weight every two months and in a month we will need to move this octopus to a larger tank and in a couple of months we will need to release her back to the ocean because she will be too big.” Unlike the other creatures that spend the whole summer, the aquarium will replace the octopus as they grow out of their tanks. A catch and release aquarium? Click to Tweet. #Ucluelet aquarium on British Columbia’s Vancouver Island has a new spin on animal attractions! Click to Tweet. Discover more about the temporary residents of #Ucluelet Aquarium: Click to Tweet. My favorite way to watch wildlife is from a boat. Perhaps I’m a bit lazy but I like letting the boat do the work while I do the viewing. Whisper Charters in Moss Landing, California has reinvented the nature touring experience with its electric boat. Ordered specifically for wildlife touring of California’s Elkhorn Slough, the Selkie II can motor ten hours on a single charge. As the company name implies, motoring is done as quietly as a whisper, letting you move among the wildlife with little disturbance. The smooth operation makes the boat a perfect platform for photography and video. The boat has comfy seating for six and windows that roll up and down to keep you snug in cool winds and allow unobstructed viewing in nice weather. With a small number of passengers, customer service is excellent. Founder Brian Ackerman meets guests at the parking lot with a pass and escorts them to the launch where soft music plays and coffee or wine are waiting. I felt like a movie star as I embarked on some world-class wildlife viewing! Discover how Whisper Charters has reinvented the nature touring experience with its electric boat. Click to Tweet. 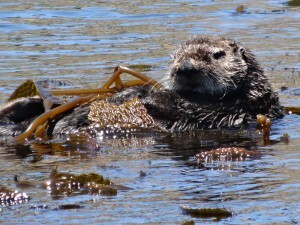 Whisper Charters provides fabulous tours of @elkhornslough letting you move among the wildlife. Click to Tweet. Learn why I love this reinvention of nature touring in California in my virtual tour. Click to Tweet.